Come and join the Presbyterian College Blue Hose Men’s Soccer Showcase Camp from the 27th of July until the 29th of July. It is inviting all male soccer players in grade 9 up to grade 12. The program is designed for those who are interested in playing at the college level. This three-day event is going to take place at the leading-edge Martin Stadium at Edens Field which is on the Presbyterian College campus. In addition, this showcase camp includes technical and tactical skills development sessions and games. There will also be a college recruiting process talk and a question and answer session with the Blue Hose coaching staff and current players. Presbyterian College, formerly Clinton College, is a private, coeducational, liberal arts college in Clinton, South Carolina. It is an affiliation of the Presbyterian Church, a Protestant Christian denomination. The university as a whole has an accreditation from the Commission on Colleges of the Southern Association of Colleges and Schools. Meanwhile, its School of Pharmacy has also an accreditation from the Accreditation Council for Pharmacy Education. Presbyterian College is currently serving around 1,200 undergraduate students. 46 percent of this undergraduate student population are male students and 54 percent are female students. This undergraduate student population is also through a selective enrollment acceptance rate of 60 percent. Correspondingly, Presbyterian College’s student to faculty ratio is 11:1. Moreover, the Presbyterian College is 123rd in National Liberal Arts Colleges category of the 2018 edition of the US News and World Reports Best Colleges rankings. It is also 110th in the High School Counselor Rankings. In the athletics world, Presbyterian College fields 15 intercollegiate men’s and women’s sports teams in the National Collegiate Athletic Association (NCAA) Division I, Big South Conference. They are the Blue Hose and garnet and blue are their identity colors. The Presbyterian College Blue Hose men’s soccer head coach is Jonathan Potter. He is a bachelor’s degree in physical education with a concentration in sport management and a minor in business administration graduate from Chowan University. He is also a master’s degree in athletic coaching education from West Virginia University. Coach Jonathan Potter is now in his third season at the helm of the Blue Hose men’s soccer program. Ultimately, in the season, Coach Potter lead the Presbyterian Blue Hose team to a Big South Tournament Championship and an NCAA Tournament appearance. Coach Potter is a United States Soccer Federation (USSF) “B” coaching license holder. Then, the Blue Hose men’s soccer assistant coaches are Flo Liu, Matthew Cureton, and Evan Rogers. Coach Flo Lui, a native of Richmond, British Columbia is now entering his third season with the coaching staff. At the same time, he is the team’s recruiting coordinator. Coach Lui is an alumnus of the University of Connecticut. Coach Matthew Cureton who hails from Waxhaw, North Carolina is now in his second season with the staff. He is a bachelor’s degree in sports administration graduate from Lees McRae College. And finally, Coach Evan Rogers, a native of Simpsonville, South Carolina is a Spartanburg Methodist graduate. He is primarily working as the team’s goalkeeper coach. 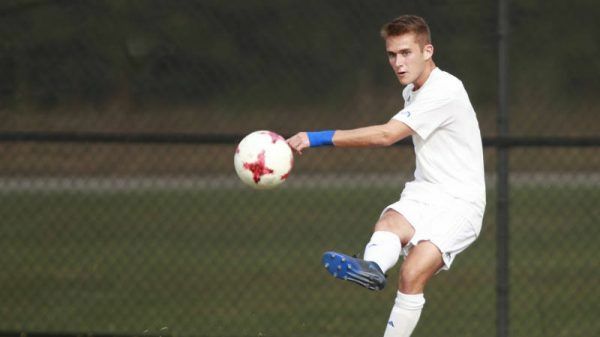 The Presbyterian College Blue Hose Men's Soccer Showcase Camp is a three-day event that will run from July 27 until July 29. It is set to start at 8:00 AM on Day 1 and end at 1:00 PM on Day 3. This is an identification camp for high male soccer players who are serious about playing at the collegiate level. Registration is on a first come first served basis.